I remember when my parents bought for me the first computer in early 2000s (dot-com era). It was based on Duron 1.3 Ghz (Spitfire), 256 Mb RAM + IDE disks, of course. You may or may not be surprised that it still works properly side-by-side with Windows XP. But technology is like a time, doesn’t want to wait. There comes a moment in every PC’s life when it must be replaced or upgraded due to incompatibility with modern applications. For instance, Windows 8 requires SSE2 CPU instructions and even Skype won’t work without them (SSE2 is a requirement for video calls). Therefore, we need to search for some replacement options. It may be a simple upgrade or purchasing a brand new PC. My choice is the second, obviously. So, please welcome Intel NUC. Intel New Unit of Computing or more simply NUC is a 4×4-inch mini-PC (barebone) and is about 1.5-2 in. thick (thickness depends on model) with built-in CPU (from Atom/Celeron to Core i7), integrated graphics, customizable board for storage and memory. Furthermore, almost all models also come with integrated Wi-Fi, Bluetooth modules, card readers and even with dual microphones. NUC is completely fanless and noiseless (except of Skull Canyon NUC series which is oriented to gamers). 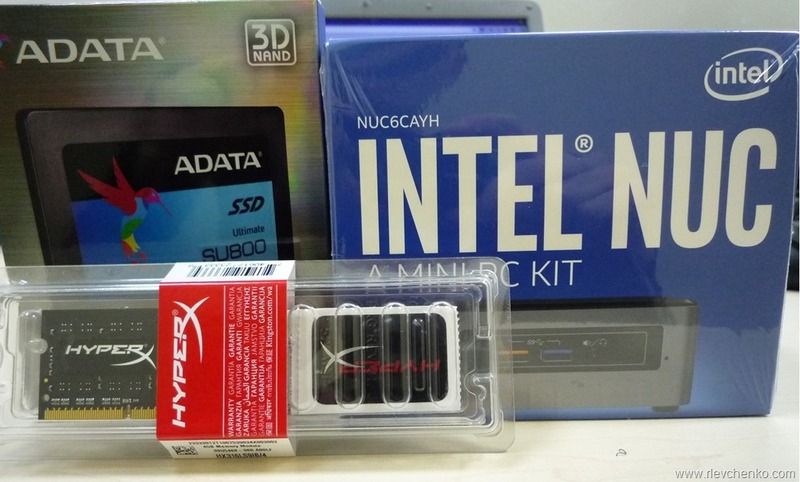 Some of NUC kits can also be shipped with the pre-installed SSD and memory. List of currently available kits is here . Well, It’s not mine anymore ‘cause I bought it to my parents . Anyway, I spent 3 days working with NUC6CAYH and really enjoyed it. It’s definitely what I searched for. Recommended price for this kit is just 139$. Additionally, don’t forget to count SSD (m.2 or sata) and memory. Installation is quite simple and takes 2 minutes (use instructions that come with your NUC). Actually, you just need to unfasten 4 screws and place ssd, memory. No cables required. TIP: NUC comes with blue indicator color for HDD activity and power leds. You can change them in bios in power section. Install OS as usual (my NUC supports only Windows 10 x64). It took me about 5-6 minutes to get Windows 10 installed. Then upgrade your NUC using the special bundle which is available at Intel support site in order to get the latest bios and drivers. Well, there is a big gap between my Intel Graphics HD 500 and HD 520 installed on kit with Core i3. Great result for this SSD. It’s inexpensive and has 3DNAND. I’d definitely recommend one. My kit is not a competitor to kits 6th and 7th generations based on Core i3 CPUs, as expected. But has a great advantage over NUCs with Pentium N3700 or lower (CPU/GPU tests). Average temperature of CPU and SSD is not high and ranged between 52-54 C. Maximum levels were during testing ~ 64C (CPU) and 54 (SSD) and I could even work seamlessly. Windows boot time is about 7 seconds (including automatic logon). 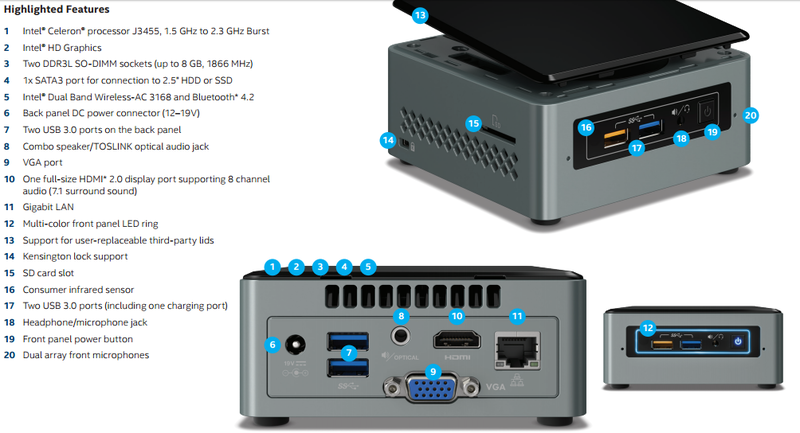 NUC is one of the most interesting mini-PC/barebone with a wide range of available configurations. It’s a real mini-sized, noiseless and can be mounted to the back of your monitor (NUC comes with VESA mounting kit). Hence, it’s an ideal solution for desktop replacement, kiosks (where size does matter) or home servers for streaming media content with the consumer IR support to control power,volume, channels remotely. Previous Previous post: How important it is to keep your desktops secured and how easily it can be achieved?